The title “500 Years of Future” suggests that at every moment of history the present has always also been a projection into the future. The gap between the present and the future is remeasured using different units in each epoch. Sometimes the future seems close enough to touch; sometimes it becomes inaccessibly distant. At times this distance is measured in nanoseconds, at other times in years, decades and centuries. Engineers try to move the temporal dimension into a spatial one and to measure the gap between the present and the future using physical categories like miles, kilowatt-hours or a tachometer, while artists often enough have to chronicle the ruins that line this route. In art, this distance is experienced in a highly subjective and non-linear way; science and technology, by contrast, strive for objectivity and plausibility. The fear of – or yearning for – the morning will always make the future appear in different colors and sizes. From a Euro-centric perspective, the calendar did not begin in the Western Hemisphere until 1507, when the name “America” appeared on Martin Waldseemüller’s map of the world for the first time. The fact that the continent had been settled for more than 20,000 years was widely ignored, partly because much of the indigenous heritage was destroyed during the conquest. In view of this large-scale eradication of history and the past, it is little wonder that the future, too, had to be postponed again and again in South America. This applies especially to Brazil, the eternal “country of the future”. If this future has perhaps now come within range for the first time in recent years, then this fact is largely due to a cultural acceleration in which the art biennials have played no small part. We would be well advised, therefore, to conceive of the future as a vision of the artists. Beyond the hemispheres, the Montevideo Biennial will disseminate those great narratives which sometimes reduce and sometimes enlarge the temporal and spatial distances between the continents, and sometimes even make them converge. The title suggests that at every moment of history the present has always also been a projection into the future. Perhaps the past and the present are nothing more than an accumulation of imaginary “futures” which in the meantime are 500 years old and divided in two halves, for the history of Europe always had to be incorporated, indeed experienced, as well in South America. Even time had been imported from Europe, after all. In 1650 the Spanish King Felipe III. presented the Cathedral of Comayagua in today’s Honduras with a clock made for the Alhambra by the Moors in the 12th century. It is regarded as the oldest timepiece in America and still works reliably to this day. A comparison between this old Arab clock and the self-built time of Mark Formanek’s Standard Time project is revealing. The former marks the beginning of modern mechanics in America, the latter a conscious return to artesanal forms of production. By taking on the challenge of building every single minute with the help of rough planks, the Standard Time workers are constantly on the verge of failure. This is a timepiece that aims to build a precarious bridge between the past and the future every day, and yet always intends to be up to date and on time. A single mistake would interrupt the inexorable flow of time forever. On the one hand, the so-called “social media” are continuously raising the speed, as though they could close in on the future and other people; on the other, more and more artists believe that the most noble task in art is to stop the passage of time, indeed even to “build” it yourself. For this reason, contemporary artists are increasingly using archives of all kinds: objects from bygone eras, black-and-white photographs from the beginning of the last century, vintage films, and found footage from the early days of the cinema. Now that everything has been photographed and filmed once before, creating archives seems to have become the most modern method, because people are expressing less and less confidence in the promises of the present. If such works abolish the usual linear notion of time and progress, the contemporary artist is often a latecomer processing ancient materials. Art is a time machine that is equally at home in the distant past as in the present, and one of the paradoxes of art is that the oldest and newest are unexpectedly closest to each other. * 1963 Neumarkt St. Veit, Germany. Lives in Berlin, Germany. * 1953 Montevideo, Uruguay; lives there. * 1972 Kolkata, India. Lives in New Delhi, India. * 1979 Schwäbisch Hall, Germany. Lives in Río de Janeiro, Brazil. * 1989 Santiago de Chile; lives there. * Bahía Blanca, Argentina. Lives in Córdoba, Argentina. * 1982 Split, Croatia. Lives in Amsterdam, The Netherlands, and Zagreb, Croatia. * 1985 Popayán, Colombia. Lives in Cali, Colombia. * 1973 Buenos Aires, Argentina. Lives there and in Montevideo, Uruguay. * 1991 Santiago, Chile. Lives in Ñuñoa, Santiago, Chile. 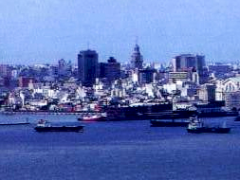 * 1967 Montevideo, Uruguay; lives there. F. Folco: * 1973 Montevideo, Uruguay; lives there. * 1967 Pinneberg, Germany. Lives in Berlin, Germany. * 1983 Santiago de Chile; lives there. * 1965 Belo Horizonte, Brazil; lives there. * 1981 Pietermaritzburg, South Africa. Lives in Johannesburg, South Africa. O. Holzapfel: * 1969 Görlitz, Germany. * 1973 São Paulo, Brazil; lives there. * 1966 Erfoud, Morocco. Lives in Paris, France. * 1963 Montevideo, Uruguay; lives there. * 1976 Bom Despacho, Brazil. Lives in Belo Horizonte, Brazil. * 1973 San José, Costa Rica. Lives in Ettlingen, Germany. S. Medici: * 1974 Buenos Aires, Argentina; lives there. P. Mallarini: * 1977 Montevideo, Uruguay; lives there. * 1968 Chiasso, Switzerland. Lives in Switzerland and Buenos Aires, Argentina. * 1976 São José do Rio Preto, Brazil. Lives in Campinas, Brazil. * 1973 Arkhangelsk, Russia. Lives in Moscow, Russia. * 1977 Buenos Aires, Argentina. Lives in Argentina. * 1970 Passo Fundo, Brazil. Lives in Curitiba, Brazil. * 1951 Buenos Aires, Argentina; lives there. A. Vallecillo: * 1977 Danlí, Honduras. Lives in Santa Lucía, Honduras. * Hubei, China. Lives in Beijing, China. * 1973 Wuppertal, Germany. Lives in Berlin, Germany. * 1949 Río de Janeiro, Brazil. Lives there and in Lisbon, Portugal. * 1966 Caracas, Venezuela; lives there. * 1969 Cuzco, Peru; lives there. * 1957 Hoyerhagen, Germany. Lives in Santiago de Chile, Chile. * 1972 Quito, Ecuador; lives there. J. López: * 1974 Havana, Cuba. * 1968 San José, Costa Rica. Lives there and in Ghent, Belgium. * 1974 Guatemala City, Guatemala. Lives there and in Vienna, Austria. * 1972 Frankfurt am Main, Germany. Lives in São Paulo, Brazil. Banco de la República, Anexo Zabala 1520. Edificio Histórico “Atarazana”, en la esquina de Cerrito y Solís.